The 1st millennium BC is the period of time between from the year 1000 BC to 1 BC (10th to 1st centuries BC; in astronomy: JD 7006135618250000000♠1356182.5 – 7006172142550000000♠1721425.5). It encompasses the Iron Age in the Old World and sees the transition from the Ancient Near East to classical antiquity. World population roughly doubled over the course of the millennium, from about 100 million to about 200–250 million. The Neo-Assyrian Empire dominates the Near East in the early centuries of the millennium, supplanted by the Achaemenid Empire in the 6th century. Ancient Egypt is in decline, and falls to the Achaemenids in 525 BC. 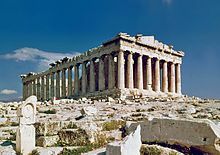 In Greece, Classical Antiquity begins with the colonization of Magna Graecia and peaks with the conquest of the Achaemenids and the subsequent flourishing of Hellenistic civilization (4th to 2nd centuries). The Roman Republic supplants the Etruscans and then the Carthaginians (5th to 3rd centuries). The close of the millennium sees the rise of the Roman Empire. The early Celts dominate Central Europe while Northern Europe is in the Pre-Roman Iron Age. In East Africa, the Nubian Empire and Aksum arise. In South Asia, the Vedic civilization blends into the Maurya Empire. The Scythians dominate Central Asia. In China, the Spring and Autumn period sees the rise of Confucianism. Towards the close of the millennium, the Han Dynasty extends Chinese power towards Central Asia, where it borders on Indo-Greek and Iranian states. Japan is in the Yayoi period. The Maya civilization rises in Mesoamerica. The first millennium BC is the formative period of the classical world religions, with the development of early Judaism Zoroastrianism in the Near East, and Vedic religion and Vedanta, Jainism and Buddhism in India. Early literature develops in Greek, Latin, Hebrew, Sanskrit , Tamil and Chinese. The term Axial Age, coined by Karl Jaspers, is intended to express the crucial importance of the period of c. the 8th to 2nd centuries BC in world history. World population more than doubled over the course of the millennium, from about an estimated 50–100 million to an estimated 170–300 million. Close to 90% of world population at the end of the first millennium BC lived in the Iron Age civilizations of the Old World (Roman Empire, Parthian Empire, Graeco-Indo-Scythian and Hindu kingdoms, Han China). The population of the Americas was below 20 million, concentrated in Mesoamerica (Epi-Olmec culture); that of Sub-Saharan Africa was likely below 10 million. The population of Oceania was likely less than one million people. Near East: 722 BC: Sargon II takes Samaria; Assyrian captivity of the Jews. South Asia: Śramaṇa movement and "second urbanisation"
Greece: beginning of the classical period (Greece in the 5th century BC). Parshvanatha, second-to-last of the mostly legendary Tirthankaras of Jainism, mostly accepted as a historical figure who may have lived in the 8th or 7th century BC. 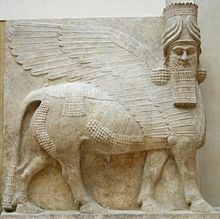 Lamassu facing forward. Bas-relief from the king Sargon II's palace at Dur Sharrukin in Assyria (now Khorsabad in Iraq), c. 713–716 BC. From Paul-Émile Botta's excavations in 1843–1844. Greek alphabet, the first alphabet with vowels. Qin built and unified various sections of the Great Wall of China. Qin built Qin Shi Huang's Mausoleum guarded by the life-sized Terracotta Army. Wikimedia Commons has media related to 1st millennium BC. ^ a b Klein Goldewijk, K. , A. Beusen, M. de Vos and G. van Drecht (2011). The HYDE 3.1 spatially explicit database of human induced land use change over the past 12,000 years, Global Ecology and Biogeography20(1): 73-86. doi:10.1111/j.1466-8238.2010.00587.x (pbl.nl). Goldewijk et al. (2011) estimate 188 million as of AD 1, citing a literature range of 170 million (low) to 300 million (high). Out of the estimated 188M, 116M are estimated for Asia (East, South/Southeast and Central Asia, excluding Western Asia), 44M for Europe and the Near East, 15M for Africa (including Egypt and Roman North Africa), 12M for Mesoamerica and South America. North America and Oceania were at or below one million.. Jean-Noël Biraben, "Essai sur l'évolution du nombre des hommes", Population 34-1 (1979), 13-25 (p. 22) estimats c. 100 million at 1200 BC and c. 250 million at AD 1. ^ Zimmer 1952, p. 182-183. ^ mostly placed in the 7th or 6th century BC if historical, but sometimes also claimed to have lived in the 2nd millennium BC, see Zoroaster#Date. ^ a b c d e f g "Who Built it First". Ancient Discoveries. A&E Television Networks. 2008. Archived from the original on 2009-05-13. Retrieved 2009-07-24. ^ a b c d e "World Timeline of the Americas 1000 BC - AD 200". The British Museum. 2005. Archived from the original on 2009-02-27. Retrieved 2009-07-25. ^ a b c "World Timeline of the Americas 200 BC - AD 600". The British Museum. 2005. Archived from the original on 2009-05-13. Retrieved 2009-07-25.